Blue Leaf staff is diverse in fisheries field applications and skilled in offering technical reporting services. We work efficiently to provide you with the necessary end product, from field communication and data summaries to extensive data analysis and technical reports. Blue Leaf is suited for field sampling of fishes using techniques that range from hook and line, seining, and electrofishing through backpack or boat operations. Our team has combined sampling and fish tracking to assess fish passage and survival metrics through biotelemetry applications. We've also sampled and tracked piscivorous fish and smolts during downstream migration to ascertain relationships of resident predators and their prey. We routinely use ArcGIS mapping tools to better understand fish sampling and/or tracking data sets. Spatial analysis tools are also commonly used to summarize behavioral data sets and integrate environmental data sets to improve and at times, solve resource challenges. Our team is fluent in conducting fish studies with various biotelemetry systems in many locations throughout the United States and overseas. Blue Leaf scientists have hands-on experience on small and large scale telemetry applications, with the use of PIT (passive integrated transponders), radio, and acoustic telemetry, including three-dimensional fish tracking techniques for behavioral and survival based studies. Our firm is equipped with Sound Metrics DIDSON imaging sonar that produces near video-quality data that we've used extensively for studying fish behavior at hydroelectric facilities. Our staff has hands-on expertise with this technology from installation and data collection to data analysis. This device is not fisheries specific-it is capable of imaging targets up to 30 meters away while operating up to 300 meters deep, regardless of light or turbidity. Blue Leaf owns this imaging equipment and can operate or lease. Please contact us if you have a study where DIDSON technology may be required. Click Here for an example of DIDSON imaging data. One of our key strengths is data management. Blue Leaf scientists, database specialists, and IT support staff provide real time data retrieval in field research applications through the use of satellite telecommunication. Our team efficiently collects, organizes, and analyzes project data, and presents our clients with information in various formats that meet their project needs. Blue Leaf IT and database managers possess expertise in wide-area network administration, server and data management, custom software development, data quality control, backup and storage, and data analysis and reporting tools. Blue Leaf is knowledgeable in fish passage issues and has a unique set of experiences in fish passage monitoring and evaluation. Our staff has conducted studies in upstream and downstream fish passage behavior, efficiency and survival at various dams in the United States. Our team has the know-how to design and conduct such studies with site and species specific issues tackled together. We know that quality broodstock is the foundation for hatchery operations. Blue Leaf has the technical field expertise and specialized relationships with professional anglers to collect broodstock. We also have scientists with extensive training and direct experience in hatchery operations. The team at Blue Leaf is proficient in evaluating and determining the need for stream restoration activities, some of which include expanding habitat of aquatic species, improving water quality, achieving sustainable flows, reducing stream bank erosion, and assessment of irrigation intake screens. Our evaluation takes into account historical environmental factors, stream hydraulics, and sediment transport when making recommendations for restoration activities. We conduct monitoring after restoration activities have been completed to evaluate effectiveness. We have the equipment and skills to create high-resolution site imagery, including panoramic digital photographs of your project. Check out our most recent gigapixel panoramic image of Wanapum Dam. Click Here. Blue Leaf staff has extensive experience with a variety of acoustic telemetry systems that were developed as fisheries research tools to help address questions about the movement patterns, behavior, and survival of juvenile salmonids and other fishes. 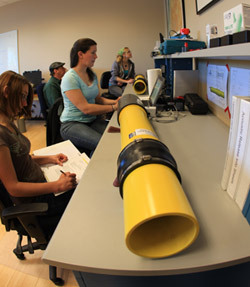 Implementing a successful acoustic telemetry project of any scale requires careful pre-deployment planning, equipment knowledge and selection, a carefully engineered deployment strategy, good data collection and management protocols, and thoughtful and appropriate analysis. Blue Leaf Environmental’s team of specialists can offer hands-on training on all project aspects described above. We offer training beginning with the development of a research question, and following the project through equipment deployment, simulated fish movement, data collection and processing from receivers, data analysis, results visualization, and reporting. We will provide you with the knowledge and skills needed to design and implement a successful acoustic study of your own. We offer consultations, at no cost, to discuss your project and needs. We have technical expertise in nearly all facets of fisheries telemetry and are happy to share what we've learned over the years. We are not a manufacturing company and thus are not bound to a particular product or vendor. This allows us to have tremendous flexibility in project design and to implement technologies where appropriate. For example, in one study alone this season we are using equipment from Lotek, HTI, Biomark, Teknologic, and InterOcean Systems to provide answers to a very complex question on the Columbia River. We are a leading source of knowledge in the industry and we are always willing to share that knowledge. If you are considering a study please drop us an email or give us a call.